Our national transportation conversation has us obsessing over finding more money to continue to do the same thing. This is only making us poorer. Instead, we need to focus on finding ways to make better use of our existing investments. This means we need to spend our energy converting our most expensive, least productive and most dangerous transportation investment — our stroads — into either wealth-producing streets (to create a place) or highly productive roads (to connect productive places). From a technical standpoint, this is very easy. From a cultural standpoint, it is near impossible. If we want to build financially productive places, we need to recognize our stroads and support actions to eliminate them. When we convert a stroad to a street, the emphasis should be on creating a successful place. This means we have to slow down traffic — actually constrict the speed that people can drive — to make the place safe and inviting for people outside of cars. We must also prioritize the activity and safety of people over the movement of traffic. This impacts our street design but also the placement, scale and orientation of buildings. The environment should be reconfigured to a human scale, not a car scale. A street is human habitat and humans, outside of their vehicles, are the indicator species of success. To build wealth, we actually need to build. We must allow, by right, the next increment of development everywhere and at all times. A successful place will experience development pressure to incrementally improve, intensify and expand existing structures, as well as to fill in any gaps that might exist. Our regulatory approach needs to recognize and facilitate these investments. Finally, we must be aware that productive places change over time. Street transformation projects that try to jumpstart development by building a finished streetscape are, more often than not, counterproductive. Focus on the development — on attracting incremental investment — and then modify the street over time, responding to the level of private investment that has been made. When we’re building a great road, we’re trying to move people and goods over distance at speed. This is a simple undertaking, and we need to discipline ourselves to hold to this simple task. We should not allow extraneous accesses onto our roads. Intersections, on-ramps and exit ramps slow down traffic and artificially create congestion. Interchanges should be many miles apart and should focus on moving traffic, not facilitating development. We should not mine — or allow others to mine — the large public investment in roadway capacity for the short term economic gain of a few (i.e. those who live or work near the on- and off-ramps or intersections). That is what we are doing when we add accesses to our roads. We are stealing pennies from everyone and throwing most of them away while giving a handful to the adjacent land owners. It’s bankrupting us. With a road, just focus on moving vehicles. Resist the temptation to build a Swiss Army gadget that tries to do everything. It doesn’t work. Just build a great road. 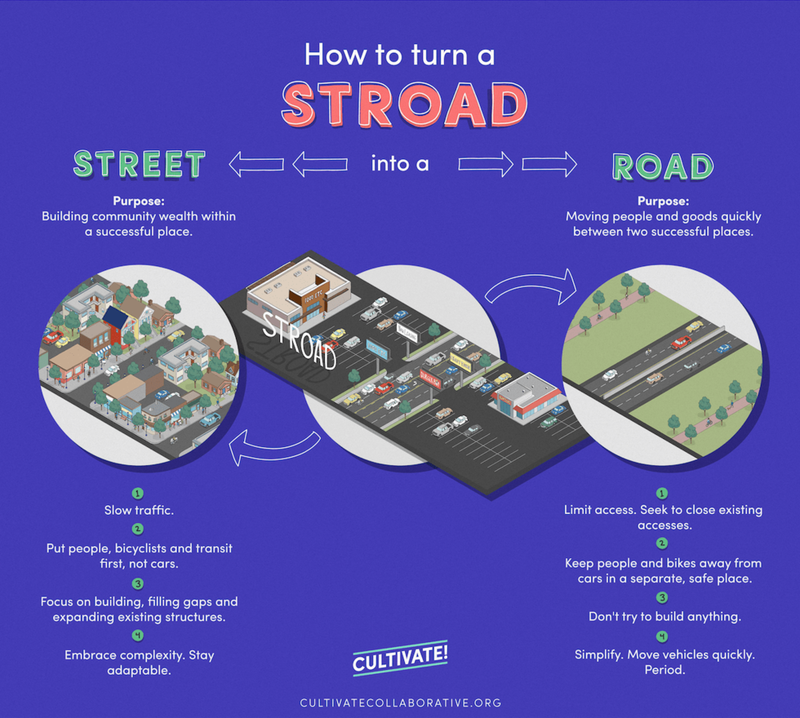 In short, we can turn a stroad into a street by slowing down cars and intensifying the land use, allowing for incremental development along the way. We can turn a stroad into a road by limiting access, simplifying the landscape and completely separating other uses. Take these steps and you're on your way to building a stronger town. All graphics by Jordan Clark for Cultivate Collaborative. Building for cars or building for people? 2 streets illustrate this distinct difference. Once nearly identical, today two streets in this town have become radically different.